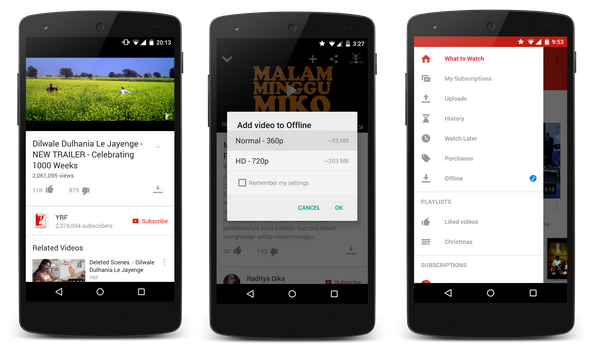 As Announced at the Android One event, Google planned to make video available in Offline mode to some few countries. So yesterday they have enabled the feature silently, this would work by introducing an extra button with a downward arrow as an icon under the video, which if pressed, will prompt you to select the video quality you want to download. And being in India, such functionality for offline support will come as a much welcomed feature, especially by those with sparse access to 3G and 4G. Scheduled to go live within a few weeks, the release of the feature was pushed back for months until, well, now, because it seems like this feature is finally rolling out in India. The release will be in stages, so users in India should be receiving notifications for a Youtube update in the upcoming days. So to the folks waiting patiently, or justifiably restlessly, hold tight, because you’ll be able to watch offline Youtube videos very soon.